*This offer is now over. Thanks. And I need the support of a small army of people who are even crazier than me. I’m putting together an Influencers Group to help me create a groundswell surrounding the launch my new book The Power of Starting Something Stupid. The release date is March 5th. I’ve spent six years putting this baby together, and now, I’m in search of a dream team of authentic, dedicated, positive and proactive wave makers to help me spread the word over these last few weeks before and after the book hits shelves on March 5. It won’t be allllll fun and games (just mostly). I’m going to need a lot of help. It’s going to be work. There may be blood, sweat and tears. (Joke. Okay, half joke.). But, I promise you’ll get a glimpse into the other side of the book world and much more. 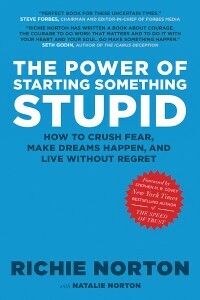 Advance reader’s edition (galley copy) of The Power of Starting Something Stupid. You’ll see the book before the rest of the world. A galley is a rare, pre-publication (a collector’s item if you will). Audio download of Résumés Are Dead and What to Do About It. Access to me (and the other influencers in the group) in an exclusive Facebook group during the period surrounding the launch. This group may just turn out to create mutually beneficial relationships that could last a lifetime. You never know. Share information about the book far and wide—leveraging your unique strengths and avenues of influence. Join the Influencers Group (link will be sent to you if accepted) on Facebook, and be an active participant and collaborator: sharing ideas together to help each other more effectively spread the word. THIS BOOK IS BEING ADDED TO MY STUDENTS REQUIRED READING LIST. Wow! Thank you so much, Carol! It means the world. I sent you an email to see how I can further help your class(es). Deeply appreciate it! looked at your email- too late to apply- but you know I am streading the word far and wide! Richie, I know i’ve passed the deadline but if I can help in any way shape or form. email me. I’ll do it. I believe in you and your book and the power of starting something stupid. After reading this post about 10 Questions, be sure to check out an article I wrote that was published in the Deseret News paper: 10 Ways to Make Your New Year’s Resolutions Stick. 10. What do you need to leave behind? 9. What do you need to bring with you? 8. What did you avoid doing that you wish you’d done? 7. What will make you feel successful? 6. Why do you really want to accomplish those things? 5. How badly do you want it? 4. If you could only do one thing today to help you reach your goal(s), what would that be? 3. If there were only one person you could trust to hold you accountable to help you stay productive, who would that be? 2. If you could be anywhere today to be your most productive self (realistically), where would you be? 1. Will you do the work? To get the most out of this post, take a second to read 10 Ways to Make Your New Year’s Resolutions Stick. I love this, Richie! We get answers in life when we ask questions. Too often, we just move day-to-day on autopilot, wishing for change, hoping for a miracle, yet never ASKING the questions we need to ask to allow our minds to see the obvious answers. It reminds me of WEndy Watson nelson’s book – change your questions, change your life. great stuff! thanks!